PA “foreign minister” says US will have to negotiate with PA now that it has assumed presidency of the Group of 77. 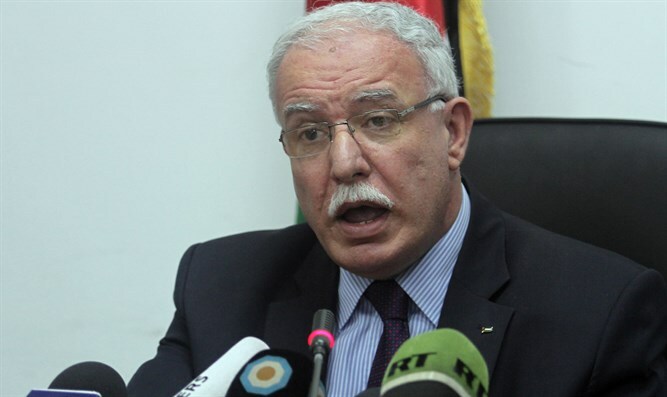 The Palestinian Authority’s (PA) “foreign minister”, Riyad al-Maliki, said on Wednesday that the US will have no choice but to negotiate with the PA now that it has assumed presidency of the Group of 77 and China in the United Nations. Speaking on Palestine TV and quoted on the PA’s official news agency Wafa, Maliki said that “Palestine” is going to negotiate development issues with industrial and advanced countries on behalf of the Group of 77, including with the US. The PA assumed the chairmanship of the Group of 77 bloc of developing countries earlier this week. In October, the United Nations General Assembly voted in favor of allowing the PA to chair the group in 2019, thus allowing the PA to act more like a full UN member state during meetings in 2019. Shortly after it started its term as Group of 77 chair, Maliki announced the PA will launch a bid to become a full member of the United Nations. Such a move, however, would need to be approved by the UN Security Council, where the US has veto power and would more than likely use it against the decision. While Maliki is demanding that the US engage with “Palestine”, the PA has rejected a US plan for peace between Israel and the PA before it has even been unveiled. PA chairman Mahmoud Abbas has been boycotting the US ever since President Donald Trump’s recognition of Jerusalem as Israel’s capital in December of 2017.